We offer wide range of pre mix preparation plant, such as Upma / Gulabjamun / Dhokla / Idli premix etc. 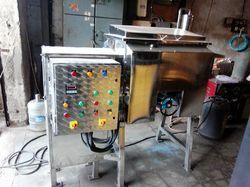 We offer online/offline weighing systems, online magnetic separators, process equipments such as shifters, blenders, roasters, cooling blenders, discharge treys with trolleys, tot bins, storage silos, intermediate screw conveying systems, process equipments control panels, along with utility services like structures, piping work etc. Till now we had successfully commissioned such types of plants for various reputed organizations. The complete plant can be fabricated as per customer requirements, in various capacities from 1TPD to 20 TPD having Full Stainless Steel construction (GMP MODEL) OR with contact parts in Stainless Steel and Non contact parts in Mild Steel with Enamel / Epoxy paint (STANDARD MODEL). Gulab jamun Premix Plant offered comes designed using latest technology support and feature precision construction standards so as to allow for reliable and consistent working performance. Further, the perfect and homogeneous blending and mixing support provided by the plants also assure of best possible pre mixed output. We can offer these plants in stainless steel construction finish in different capacities as per the requirement. Further, the support of SS contact parts and enamel painted mild steel non-contact parts also assure of the system's delivering reliable and consistent performance. Upma Premix Plant offered is well recognized for providing homogeneous mixing support for upma premix. Further, the consistent working performance of the plants also assure of its reliable and consistent working performance. 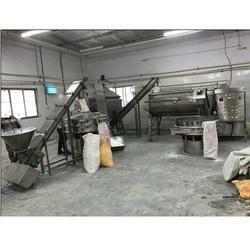 These premix plants can also be operated as per the specific process requirements and supports production of premix that can easily and quickly be cooked as thick porridge which is common South Indian snack as well as a popular breakfast choice. Instant Laddu Premix Plant offered comes designed and developed using latest technology support and can be made available by us in different operating volumes and specifications as demanded by the customers. 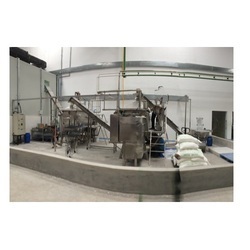 Providing for consistent and smooth mixing support, the output provided by these plants assure of reliable working. Full stainless steel construction with contact parts in stainless steel finish.